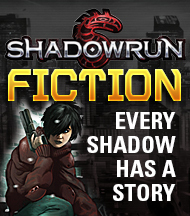 Welcome to 2013—the Year of Shadowrun! 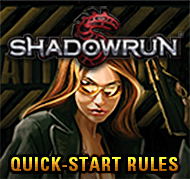 As you may have seen in this announcement, we have some big things planned for Shadowrun in the next twelve months and more. With Shadowrun: Crossfire (the card game), Shadowrun, Fifth Edition (the new version of the tabletop role-playing system), Shadowrun: Sprawl Gangers (the miniatures game), and Shadowrun: Hostile Takeover all in the works, there will be plenty of news to pass along. 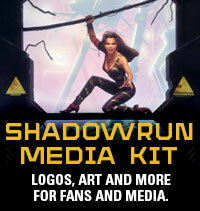 Shadowruntabletop.com will be your primary site for news on these products, and you also should keep an eye on Shadowrun.com for updates on all Shadowrun-related products, including the Shadowrun Returns and Shadowrun Online video games. And if you’re thinking of visiting shadowruntabletop.com, do it now, because the fun has already started. For the next six months, in-universe blog posts will appear on the Shadowland and JackPoint web pages, and they’ll be accompanied by a regular stream of tweets from @shadowland2054 and @jackpoint2075. Make sure you check them out for your updates on what’s happening in the Sixth World. Also, if you poke around the shadowruntabletop.com website a little, you’ll find some preview material from an upcoming Shadowrun sourcebook called Storm Front, that brings many of the plot threads from the past year to a head. Get information on the end of the Aztlan-Amazonia war, the finale of the clash between dragons, chaos in Denver and Seattle, and more by solving the puzzles and putting the fragments together in the proper order. You’ll also find information on the next source of chaos that will send the world into a tailspin—and keep the shadows flowing with nuyen. That’s what’s going on now—so what’s coming up? Well, in the very near future you’re going to get a preview of the Shadowrun, Fifth Edition cover art by Hugo Award-nominated artist Michael Komarck. Michael has done great work for Shadowrun in the past, like the covers of Street Magic and Running Wild along with images like this one and this one. Also, we know that there are plenty of questions about the new games—what’s going to be in them, how they relate to each other, and what was going on inside the various developers’ minds as they designed the games. To that end, we’ve lined up developers from all of the games (Mike Elliot to Rob Heinsoo, Jason Hardy to Randall Bills, and more!) to contribute to this blog and provide an inside look behind the scenes about the development process and what you can expect from the upcoming games. So keep your eyes on shadowruntabletop.com—we look forward to sharing information and interacting with the awesome Shadowrun community as the Year of Shadowrun moves forward!